Ah, the leadup to Mobile World Congress, where high-end device leaks flow like milk and honey. 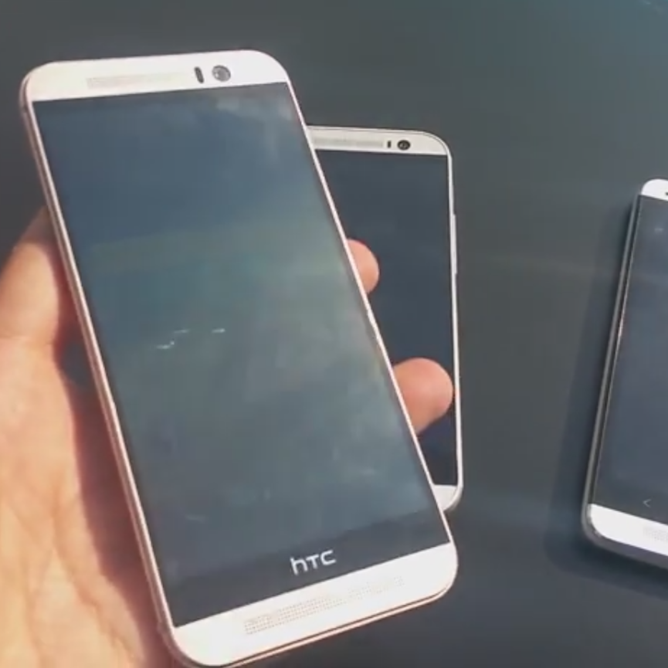 After Samsung's Galaxy S6 and S6 Edge have been almost entirely revealed, we've now got a video demo'ing HTC's next One flagship, the M9. The video below from YouTube user Samia Lou shows off the unreleased M9 next to its One series predecessors, the One M8 and M7 from 2014 and 2013, respectively. Nothing's official until it's official, but this removes pretty much all doubt about the M9's physical design. The M9 keeps the same basic One family traits including the metal unibody and dual front-facing speakers, with an added piece of gold-colored metal trim around the bezel, iPhone 4-style. The power button has been moved to the side of the device next to the volume buttons, which are now separated instead of integrated into a single rocker. As revealed in previous leaks, it looks like HTC is giving up on the Duo camera system that debuted on the M8, instead opting for a single one-lens camera with a reported 20MP sensor. The video poster claims that the 4-ultrapixel sensor has been repurposed for the front-facing camera. This hands-on matches previous leaked videos, which lacked details but appeared to be part of an official press package. There doesn't appear to be any sign of an alternate design with a Samsung-style home button, so perhaps that was an early prototype that never made it to production (or just a fake). We haven't heard much on the technical side of things, but a high-end Qualcomm chipset and Android 5.0 (plus HTC's Sense skin) seem like obvious choices. HTC will reveal its new flagship at its Mobile World Congress presentation tomorrow.